As I walked the fairway at the 2013 Pebble Beach Concours d'Elegance, one car in particular stopped me dead in my tracks. 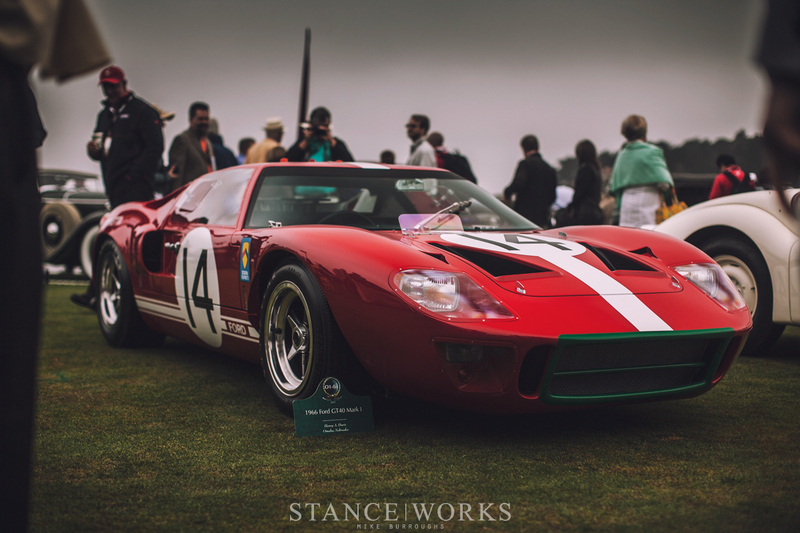 Ford's GT40 is unquestionably one of my favorites; backed with truly stunning lines and an even more impressive pedigree, the Le Mans racer is one of the few truly successful American grand tourers. Best of all, the GT40 was born purely out of spite as the result of a growing feud between Henry Ford II and Enzo Ferrari himself. 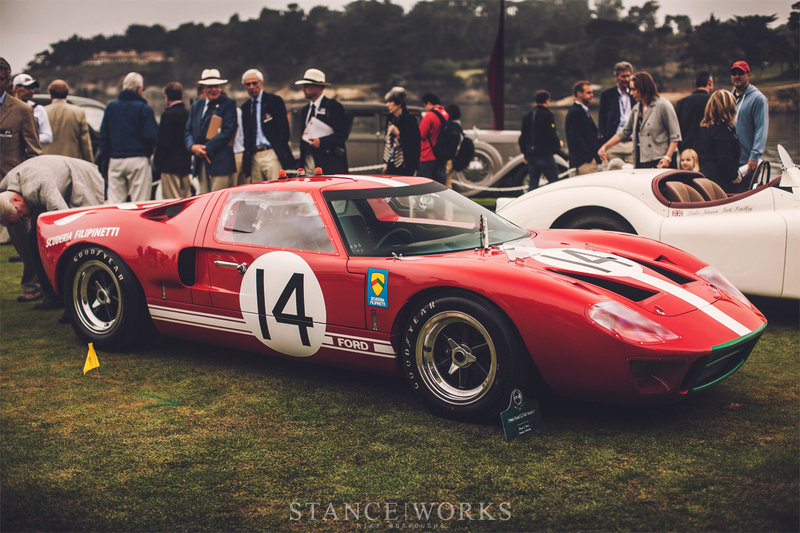 The Ford GT40 was built to compete in the world-renowned 24 Hours of Le Mans, heralded by many as the most prestigious race in the world, and it was built with one goal in mind: beat Ferrari. And beat Ferrari, it did. 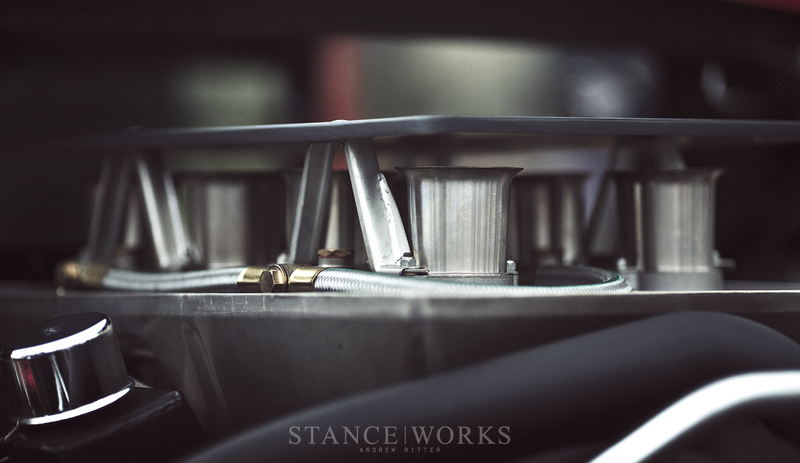 While there's far more to the story, the simple details alone are enough to tease the appetite of any racing fan. Ferrari had established themselves as the team to beat, having taken the overall victory at Le Mans every year from 1960 through 1965, meaning Ford had more than an uphill battle against him. Ford's desire to compete in Le Mans had been brewing since the early 60s, and the tensions between himself and Ferrari, catalyzed by the result of Ferrari's withdraw from the sale of his company to Ford in 1963, served as the perfect excuse to enter the world of prototype endurance racing. In 1966, after two seasons of testing and research, Ford's GT40 smashed Ferrari at the 24 Hours of Le Mans, taking home first, second, and third place overall. Not far behind, in 5th place, was this very Ford GT40, chassis GT40P-1040, fielded by Scuderia Filipinetti. #1040 trailed in fifth place until the 17th hour, when the back-left of the car was severely damaged, eliminating it from the race (pictured above.) The car was rebuilt, and for the 1967 Le Mans trials, the car proved to be the 7th fastest in the field; however, #1040 caught fire during the 1967 race at Monza, ultimately ending its racing career. The car's tub was first stored at Filipinetti, and then with his chief mechanic Franco Sbarro. The car was in storage for nearly a decade until 1975, when the Swiss Charles Gendoz bought #1040's tub and parts for restoration. The fire hadn't affected the chassis's rigidity, allowing Gendoz to restore the car using the chassis as it was received from Sbarro. In 1977, two years later, #1040's restoration was complete. The car was painted metallic gold with black sill stripes, and was reupholstered to a black and red interior, a fate that was unlikely ever considered by anyone at Filipinetti when the car was originally received. The car changed hands several times in 1977, moving from Gendoz to Swiss broker, Rob de la Rive Box, and then to the prominent GT40 dealer, Harley Cluxton III, here in the United States. At the end of 1977, the car was acquired by Don Silawsky, whom kept the car. In 1988, Don decided to completely restore #1040. In 1989, Silawsky hired Tom Milner Racing to disassemble the car and begin the project. After deconstruction, the car's chassis was mounted to a rotisserie, where it was then discovered, after a complete view of the car was possible, that damage sustained through its early racing career meant a more intensive restoration than Silawsky had initially anticipated. While Silawsky explored his options, the car's components and chassis were sandblasted and boxed up. A coat of black primer was sprayed on the tub to prevent any further rust and corrosion. #1040 was wheeled back inside, where it sat while Silawsky sorted things out... for 18 years. Ronnie Spain is recognized as the end-all when it comes to GT40s and their provenance; he's widely considered to be the "foremost authority," and as such, in 2007, Spain was called in to verify the authenticity of #1040's tub. Throughout the years, between its changes of ownership and history of teardowns, true confirmation of its origin had to be verified to prove its authenticity. 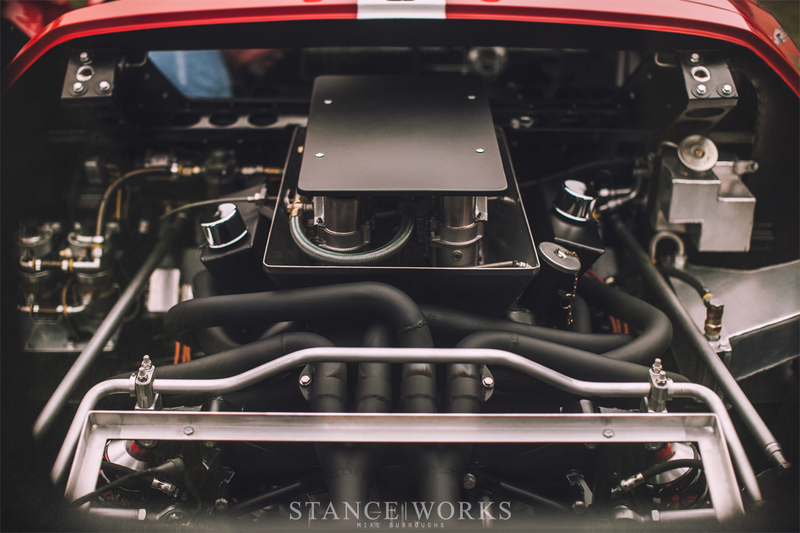 As one of only six 1966 GT40 MK1s built specifically for long-distance racing, it's most stand-out feature is the "fuel crossover system," shown below as a Ford Advanced Vehicles mechanic installs the system, and proof of its presence still in-tact beside it. Other important intricacies of the car stand out - a buckle in the roof remains from the fire at Monza in '67, when the car was lifted by its roof causing it to bow. 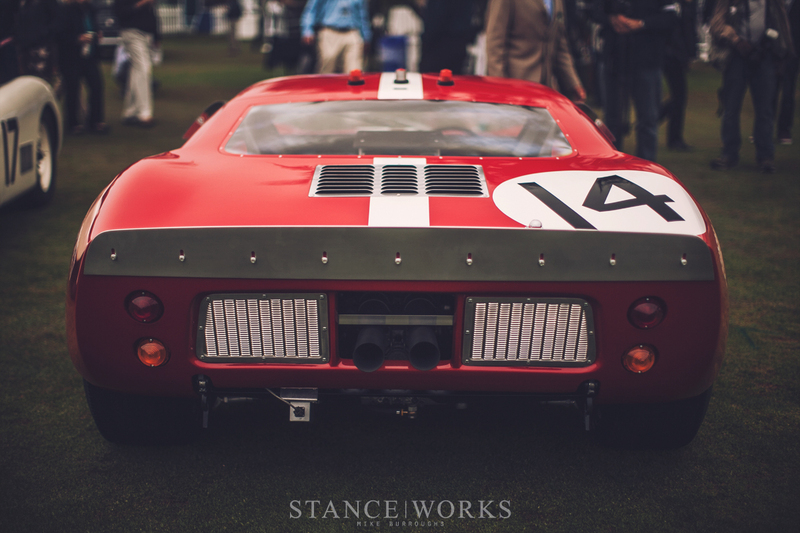 #1040 raced in the '66 Le Mans with 3 lights atop the car, and with the primer and bondo removed, the original mounting holes were found, helping to prove the car's lineage and history. With Spain's seal of approval, as well as approval from the Shelby American Automobile Club, one step remained before reconstruction began. 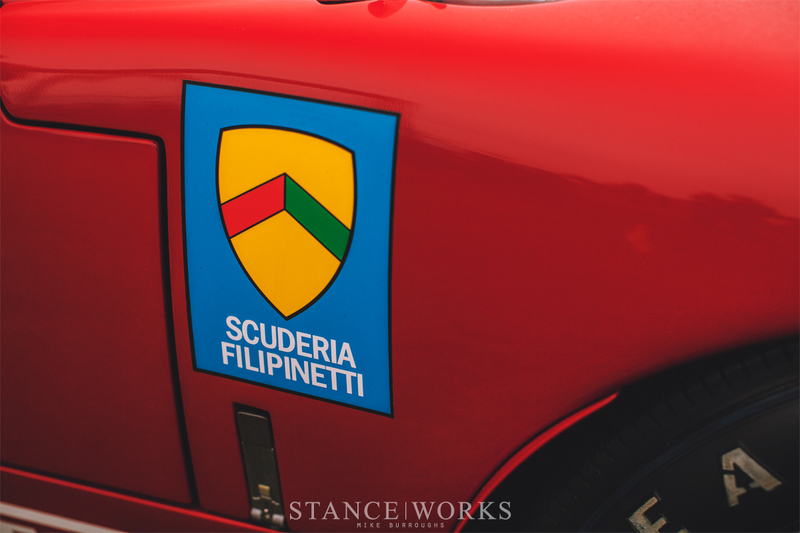 To finalize the verification, an FIA representative was brought in to inspect each part, component, number, and detail, including the car's documentation that dated back to 1966, which illustrated Scuderia Filipinetti's receipt of the car on February 28, 1966. The tub was mounted to a rotisserie, the fiberglass body panels were laid out, and every component to the car, ranging from suspension and interior bits to engine parts and electrical components were all arranged for verification. With verification that the car was indeed #1040 behind them, restoration began, and trickled down to the smallest of details. The mission behind the restoration was to ensure the car remained as original as possible, including the use of every original component that remained. Rust was extensively repaired, and metalwork was performed to restore the car's shape, contours, and even bulkhead hole-sizing. Some parts of the car, namely characteristic dents and crunches sustained during its early races, were left for documentation purposes. Every component of the car was crack tested and inspected, from suspension arms and uprights, to the original struts and springs. The original cylinder block, heads, and correct serial number Weber 48IDA carburetor system were all used to rebuild the car to perfect specifications. All of the hardware that could be re-used was inspected, cleaned, and cadmium plated, keeping the car as original as possible. The years of work resulted in the Concours car that sat before me. For the first time since 1967, #1040 adorned its original 1966 Le Mans Filipinetti livery, which was recreated to the smallest detail. The number 14, which can be seen in the car's original crash photo, has been returned to its rightful place, and the Scuderia Filipinetti namesake rests over the rear arches as it did 45 years ago. The simple details were uncountable. #1040's black nylon, grometed seats were just as they had been decades ago, and the instrumentation - Smith/CAV gauges and Lucas switches, complete with labeling - are all correct. Details such as the rooftop lights, windscreen insect deflector, and the wheel and tire package were all true to form. Under the rear bodywork of the car is an original 4.7-liter V8, stamped with the C65E-6015-A coding, paired with C6FE-9090-A race heads. Fuel is pumped in through four Weber downdraft carburetors and the exhaust is pumped out through the original sand-bent piping. The power is routed out through a 5DS25-0 ZF transaxle, and to the ground through a massive set of period-correct 1960s Goodyear Bluestreak tires wrapped around 10" BRM centerlock wheels. 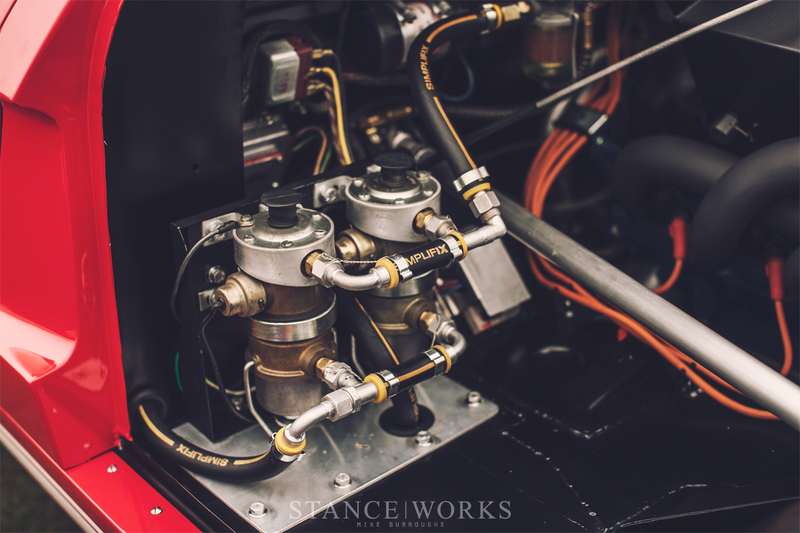 The restoration attempted unparalleled levels of authenticity, utilizing a pair of SW240A fuel pumps plumbed with the correct Simplifix hosing BSP fuel line fittings, the Ford transistorized ignition system, paired with Autolite date-coded sparkplug wires. British GKN lettered bolts and other immeasurable details seal the deal. The tailpipes are routed under the FIA-mandated "luggage box rack," ejecting from the tail of the car in perfect racing fashion. The detail work of the build, while familiar to those involved and aware of the intensity of Concours restorations, have offered a unique look at the level of authenticity some strive to achieve. While I work on my own cars, wondering if my work will pass as sufficient of "hack job," there are a select few who choose to take things to an almost unachievable level. "Do these bolts have the right letters stamped in the heads?" is a question I assume I will never be asking myself. GT40P-1040 was a true treat to see; while I was unaware of its intimate history right away, the joy of seeing such a legend in person was a special opportunity in and of itself. The craftsmanship, time, effort, and money that have gone into restoring such a car were met with recognition - Henry Davis's #1040 GT40 took home the "Post War Sports/Racing" category top honors for the event. Now the important question is will such a flawless restoration ever see the track again? A special thank you to RacingIcons.com for images and information of the rebuild. 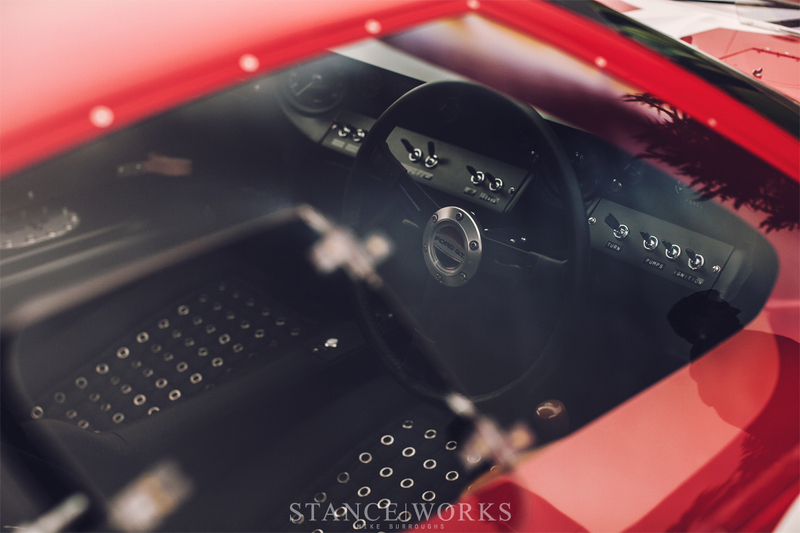 Check out their site for a wealth of information about the GT40 and for more rebuild photos. Duuude! What the hell?!! “fuel crossover system”/ “cadmium plating”? This article just sucked me in and blew my mind on so many levels. Race cars with history and mystery gotta love it! Could someone please tell me where do you guys get the textures for editing? 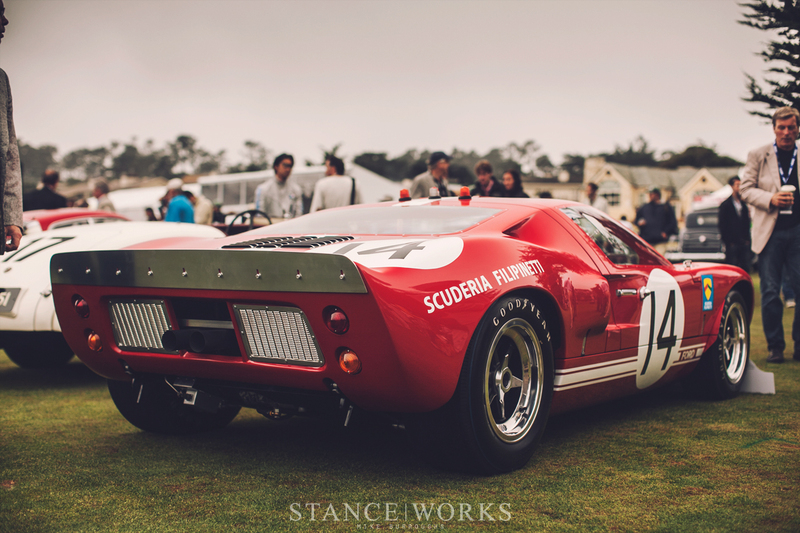 Not to be a possible buzz kill, but I am almost positive the Mrk 1 GT40 never beat any Ferraris at LeMans. 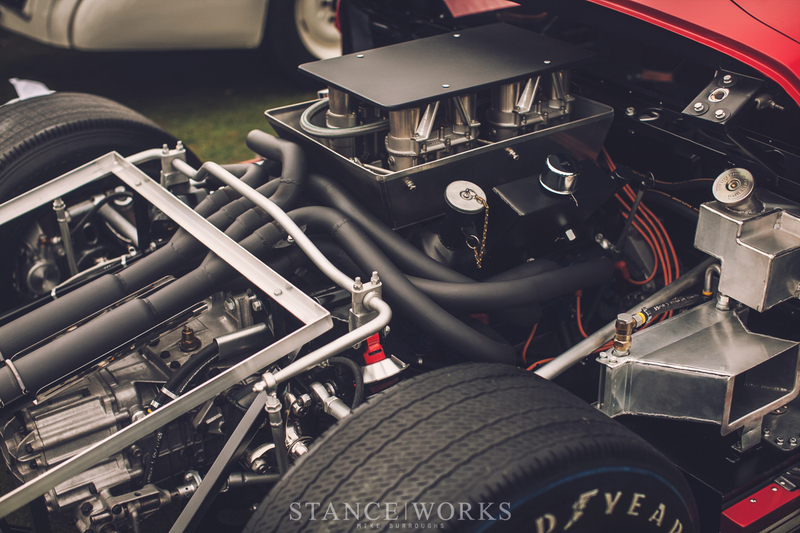 By 1966 it was the Mrk II’s with the 427 engines (7.0 liter) not the 289 (4.7) that trounced Ferrari. Daytona 1966 gt40 mk1 prepared by carol Shelby beat private ferraris, le mans in 1968 and 1969 had a 5 litre restriction so mk1 won that also….. check your racing history.